You are here: Home / news / Soundcrash presents: The Nextmen at Koko. 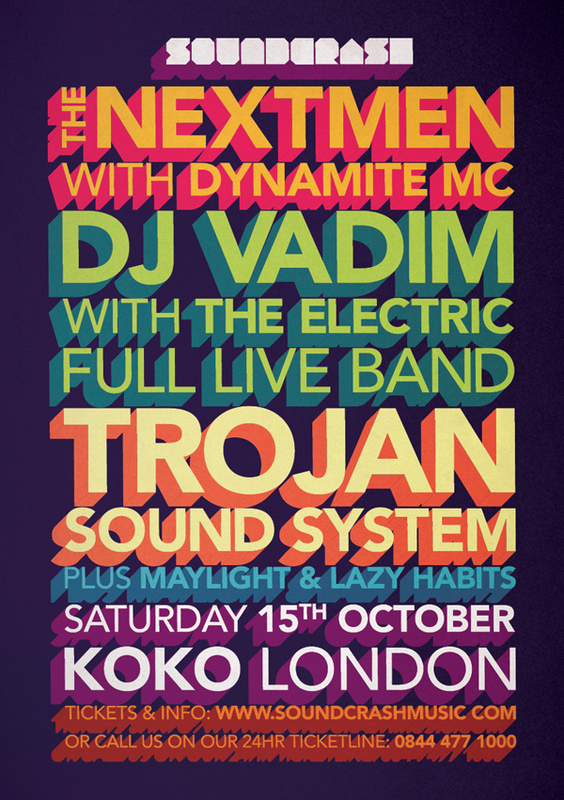 Soundcrash presents a night of mashup goodness, soul-drenched grooves and reggae party vibes at KOKO, a perfect antidote to the onset of Autumn. Unless you have fallen lifeless somewhere through the cracks you’ve more than likely witnessed Cambridge come Londoners The Nextmen, also known as Brad Baloo and Dom Search, at one of their many sweaty styled-out club sets, festival-stopping performances or heard their now legendary podcast series. Joining them is Dynamite MC, for what promises to be another classic Saturday bash in London. Soundcrash favourite DJ Vadim has been at it for what seems like forever and yet he still manages to sound as fresh and when he started. From his beginnings creating moody abstract Hip Hop to his latest incarnation as a soul infected groovester, Vadim always hits the right spot with his deep basslines, shuffling beats and infectious riffs. For Soundcrash he will be playing with his full live band The Electric, presenting proper good time vibes. The mighty Trojan Sound System needs no introduction. Trojan records are synonymous with quality original Reggae the world over, so you know what’s coming to you. Legendary selectors Earl Gateshead and Daddy Ad are joined on stage by original reggae singers to from the Trojan Sound System, an unstoppable machine spreading love, good vibes and authentic reggae party tunes wherever they go. 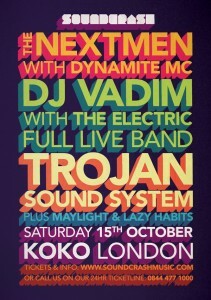 Get ready to skank KOKO!